Liberties Local Community Radio (LLCR) began broadcasting in March 1986 from Weaver Square in Dublin 8. It was run by Sammy Prendergast who was well known for installing aerials for pirate stations. LLCR broadcast on 1035 kHz AM using the old Capitol Radio rig which had been on 1017 kHz until shortly before then. It was also heard on 104 FM at a later stage. 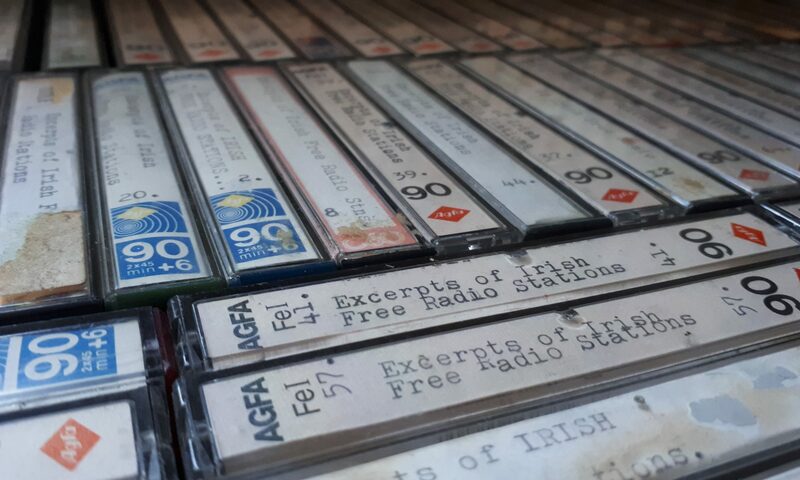 Although LLCR began by emphasising its community roots in the Liberties, it never sounded like long-standing community stations such as BLB and NDCR. There was a lot of chopping and changing in Weaver Square during its two years on air but the station had its followers nonetheless. One of its most popular programmes was a hip-hop show presented by Tony Christie. There was a lot of variation in the station’s name as these jingles and idents indicate, from LLCR to Liberties Radio to Liberty Radio. The station also announced Liberty 104 for a while and had jingles for Super Rock 104. You can hear an aircheck of Teena Gates reading news on Liberty 104 here.